Blushes can be a really great way to put some color and glow to your face. 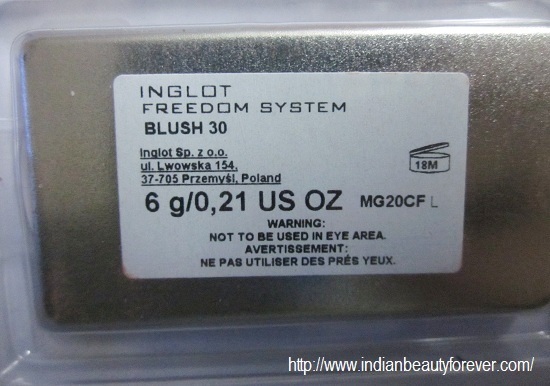 Today, I will review a Blush from Inglot freedom System in AMC 30. 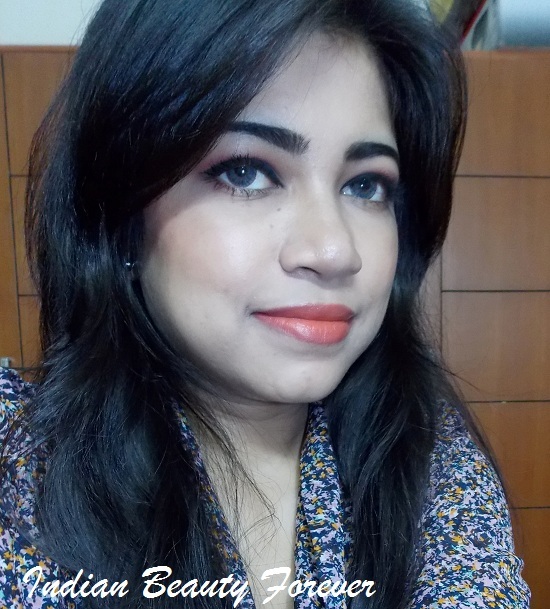 I am really into a blushes a lot these days and they can give that flushed cheeks effects very easily. Love them. I have used eye shadows and lipsticks pans from Inglot but this is my first Blush from them. 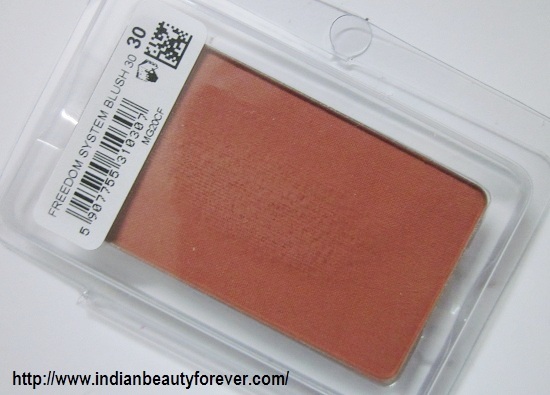 Price: This Inglot Blush comes at 350 INR for 6 g with a shelf life of 3 years. 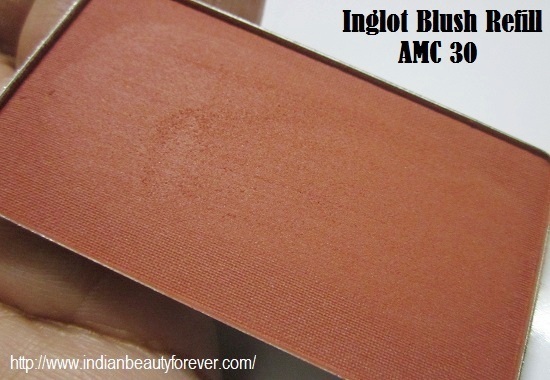 My experience: This is my first blush from Inglot. 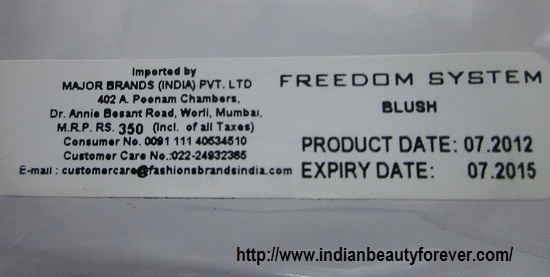 It’s a freedom system range refill so comes in a plastic pack just like their Inglot freedom system Lipstick refill. It has an outer case so it can be carried in your makeup pouch though You have to be cautious in storing it. This color is called AMC 30 which is a peach color as you can see in the picture. What i really like about this blush is that it does not have any shimmers at all which makes it appropriate for those who are not a huge fan of shimmery face products especially during the day time. Well, fine shimmers are added to most of the powder blushes so as to give your cheeks a subtle glow, but i like the blushes for the day time to be without any shimmers. 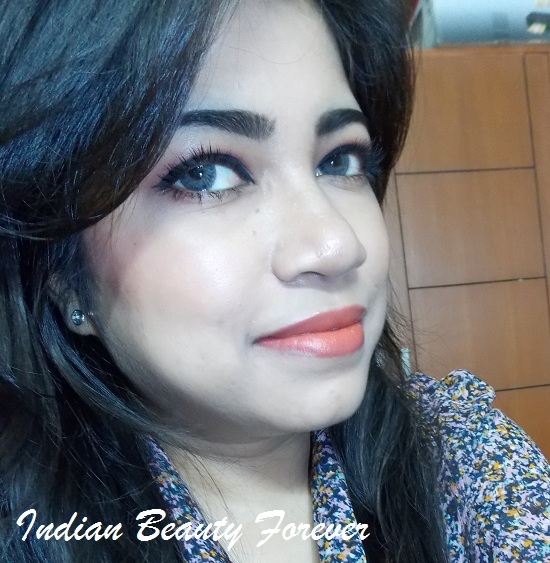 This a matte peach color like I said which is no doubt will suit most of the fair, medium to dusky skin tones. It has a powdery satin texture which is very light weight. I absolutely like it for that. A little goes on a long way and it does not even feel as if you have applied anything extra on your cheeks. If you want to know the texture then I will compare it similar to that of the Revlon moisturizing compact. It just blends like a dream. Staying power is decent enough as it is a powder blush though you can make your blush last longer by applying a cream one and then putting some powder blush. Pigmentation is great, just a little bit of this is enough! However, it depends on the skin color as well. It has a shelf life of 36 months so it’s great that you do not have to worry about it getting expired when you do have a lot of product still left in the pan. I am currently in love with this blush. It’s just amazingly pretty in terms of the color and texture. 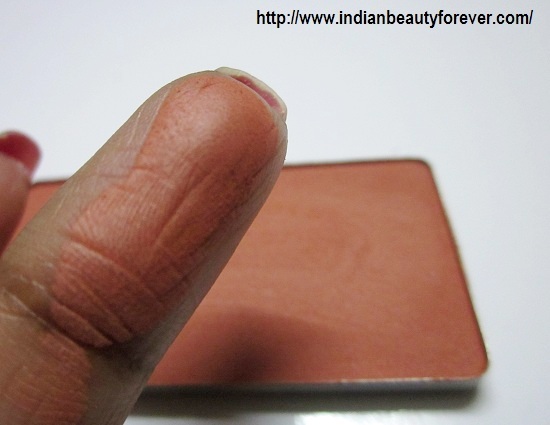 I remember, I have a Tips and toes dual blush in Autumn which has 2 colors a lighter and a comparatively darker and the dark one is a peach shade, I checked and saw that it is similar to this Inglot one except that has very finely milled shimmer. Very pretty color that is!! Here is a pic of me with this blusher. I applied it lightly and the camera made it even lighter!! Available online and Inglot store. Storing the refill is a problem sometimes. My Take: Highly recommended. Try it if you are looking for a matte peach blush and do not mind the refill packaging. It's a gorgeous subtle peach color!! 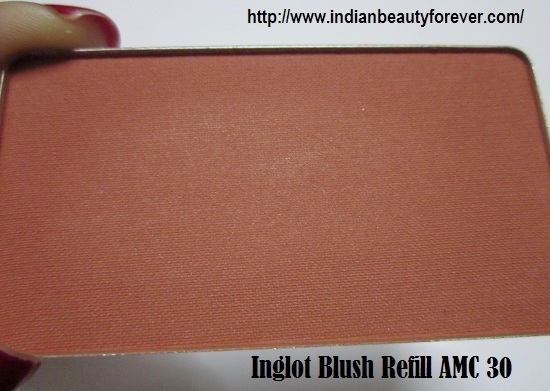 I have 3 blush refills of Inglot and I like them all. This one looks very nice too. This is the prettiest color i think that looks natural on prominent yellow under toned skin like me. even i am trying to figure out how they can be stored. Your swatch comes off so finely milled and so silky! I think I'd love their products but this one maybe a bit too orange for me but so nice on your complexion! You can try other colors though, I am sure a pinky one would look great on you. I can understand Nisha. Storing them can be tricky. I have the faces powder ones. You are correct they have shimmers that why i do not use it during the day time else it makes the shimmer more prominent. Its a pure silky matte color. very pretty! It will look fab on you!